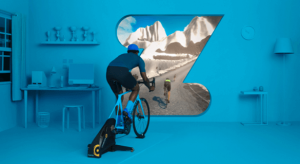 Add a new dimension to your bike training program with Zwift, the online cycle training program that allows you to connect with thousands of other cyclists worldwide in real-time. You can train day or night, regardless of the weather outside. You can avoid being on the road with careless drivers. When you are ready to train, you can get right to training without spending time changing clothes and prepping your bike for the road. While you are training, you can race or just ride with other cyclists on the virtual course that is scheduled for the day. Zwift also offers structured workouts that match your fitness level. You can work out alone or join scheduled group workouts. To join in the fun on Zwift, you will need a smart trainer, your bike, Wi-Fi, and a computer, tablet, or smartphone. A smart trainer will allow Zwift to adjust the resistance to that of the course being transmitted and to the riders around you. Bike trainers also provide two-way communication on your speed, power, and cadence with Zwift and your tablet, phone, or computer. You can set a power trainer to the power level you desire and stay at that level without stopping for traffic lights or stop signs. We have researched the features offered by various smart trainers, and written a Buyer’s Guide that discusses those features. We have also reviewed smart trainers and selected the six best. So, read the buyer’s guide, then study the six best bike trainers reviews, and choose the bike trainer that suits your needs. 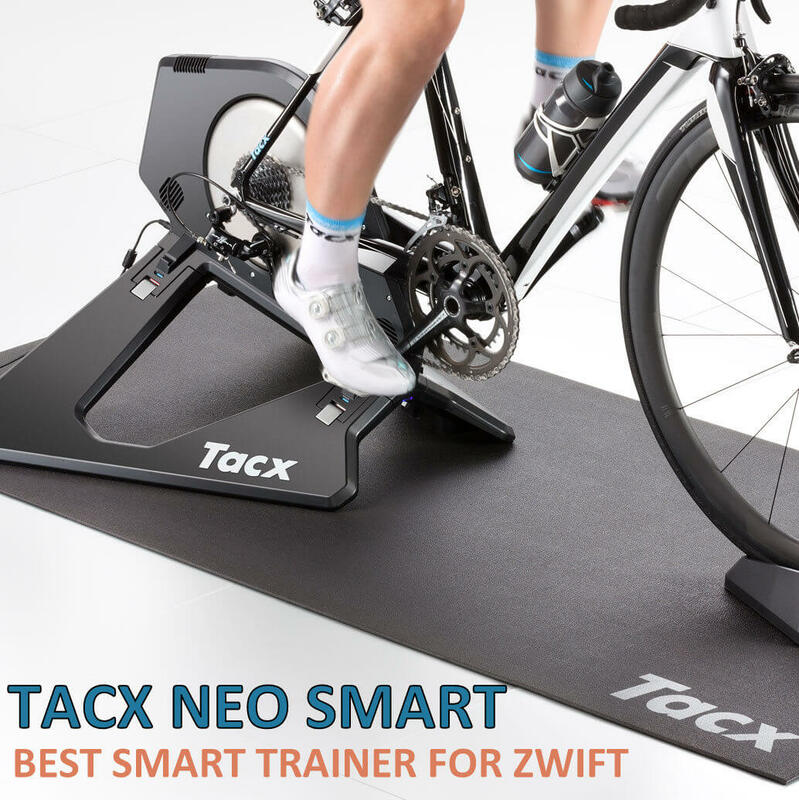 The Tacx Neo is a direct drive smart trainer. That means you will have to take the rear wheel off of your bike to attach it, but that reduces rear tire wear. It also means that your power readings are more accurate than with a wheel-on version. The powerful motor has lower RPMs to help it run quieter, registering only 70 decibels at 200 watts and 80 RPMs, with a maximum of only 80 decibels. It folds compactly for easy storage and travel, but it is stable enough to keep your bike from tipping over with you. Designed to be used with Wi-Fi or wired, it is even compatible with Apple and Android tablets and smartphones. It uses Bluetooth and ANT+. The Tacx Neo adds realism that goes above and beyond by even replicating road surfaces such as dirt, cobblestone, and wooden bridges. It provides quick response to resistance and terrain input, including a boost on downhills from its own software as well as Zwift, Garmin’s 520, and Magellan’s Mio. The ride is smooth and realistic even down to no resistances on downhills, even if you start pedaling after coasting a bit. When comparing stats between the Neo and a power meter attached to your bike, the Tacx Neo registers less than power meters and cannot be calibrated. The Neo is also not compatible with long cage dérailleurs. The resistance for power workouts is set to your fitness level. It measures 17.32″ x 10.24″ x 24.41″ and weighs 47.4 pounds. 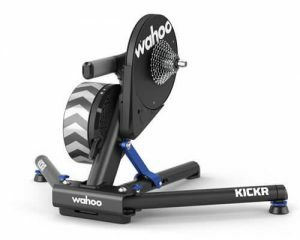 Wahoo Kickr 2018 is brand new 4th generation of the Kickr direct driving unit from the original release back in 2014, and this is the most significant upgrades to that unit to date. The same great platform many cyclists and triathletes have always come to love is upgraded. The flywheel is 33% bigger, which means more of a real road feel. It’s going to dampen more of that up and down motion that you may feel from starting and stopping, and it’s going to really smooth out your experience. The pulley his belt driven and what comes with a belt normally comes with noise. Wahoo has quietened the unit down. They’ve gone from a timing belt to a V belt internally and things are virtually silent. Wahoo eliminated a lot of that noise by innovating a quieter, more silent efficient belt structure that’s going to drive a lot of your road noise down. Especially if you annoy a lot of those neighbors who live underneath you if you’re in an apartment. The chip’s with a Shimano 11 speed 11-26 cassette, comes with the Wahoo Cadence Sensor in the box. The rear axle compatibility for 130 and 135 quick release, and the adapters in the box support thru-axle. Power accuracy claims +/- 2%, maximum power 2200 watts, and with that comes a ton of breaking force, so it can simulate gradients up to 20%. As with previous Kickr direct drive units, the support for bikes is pretty good. New Kickr got support for road 24″ through to 700C and mountain bike 24” all the way up to 29”. Also Wahoo support for ANT+ and Bluetooth connectivity. Wahoo Kickr has great portability with legs that will come in and out very easily. So, for storage, for handling, for taking to a friend’s house or to another group training environment, this handle is going to provide great balance. It’s a new direct drive interactive smart trainer so your rear wheel comes off. The Kickr Core is compatible with all the bikes. The standard quick release supports out of the box and also Thru-Axle adapter supplied: 12×142, 12×148 – all ready to go at the box. The Kickr Core comes with a Shimano and SRAM compatible hub. You will need to supply your own cassette for this unit. Connection protocols: ANT+, ANT+ FE-C, and Bluetooth Smart. Everything you want to connect to, you can connect to it with this trainer. Power accuracy claims of +/- 2%. Maximum grade simulation of 16%, which is pretty steep, and maximum wattage, 1800 watts. Flywheel size 12 lb / 5.4 kg. Similar to that of the Wahoo Kickr 2017. Unit weight to sell 40 lb / 18 kg in a small footprint box, which is an important factor. If you’re going into a store and buying something having to hold a massive box, this one’s pretty compact, goes in the back of the car, you can get this thing, move it around pretty easily. It is very quiet, and uses the same belt as the Wahoo Kickr 18. Transmits speed and power data, you will need to provide your own cadence sensor for this one. No front wheel riser included. That’s not too bad because the unit itself is quite low. About the same height as a normal wheel so your bike will be level anyway. Kickr Climb compatible with the rear pivoting axle hubs. Kickr Headwind compatible. It is because it transmits speed and you’re transmitting heart rate. There is a Spindown Calibration process required once out of the box just to be sure and once every few weeks. 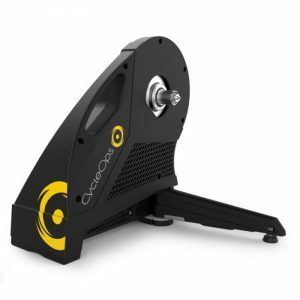 The CycleOps Hammer Direct Drive Smart Trainer is a direct drive trainer that will give you a more accurate power measurement than a wheel-on. The rear tire on your bike has to be removed to attach the power trainer, but that reduces tire wear. With the electromagnetic resistance, the CycleOps Hammer offers 2000 watts of power at 20 mph. It connects with ANT+ FE-C and Bluetooth 4.0 and can use Zwift. You can get your speed and power readings in real time, and you can transmit the data to Zwift for an interactive training experience. Connect a cassette, remove the rear tire on your bike, and attach your bike to the smart trainer. You can use the Cycleops Hammer to duplicate any of your outdoor rides, including inclines up to 20 percent. 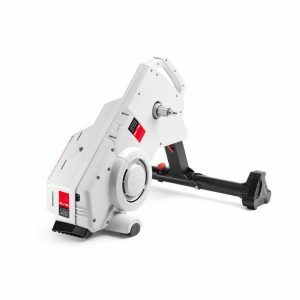 It has a revolutionary axle compatibility feature for quick release and thru-axles. The precision-balanced 20-pound flywheel uses electromagnetic resistance to provide a quiet, vibration-free, and realistic ride. Unlike other smart trainers, if you drop to 0, it does not add the resistance back until you have a good start. The noise level measures 72 decibels at 200 watts and 80 RPMs with a maximum of 86 decibels. The internal cooling technology keeps it cool even during vigorous workouts, so, using PowerTap and PowerTune technology, accurate power readings are maintained within an accuracy of +/-3 percent. The Shimano-splined freehub is compatible with 8-11 speed cassettes. The CycleOps Hammer also offers an integrated front wheel tray that sets the front wheel to the proper height, and the tray can be folded into the trainer for easy storage and access. It has spring-loaded legs and is solid so that your bike will not tip over with you. It measures 23″ x 13″ x 2 and weighs 46 pounds. The CycleOps Hammer has a lifetime warranty. The M2 is the 2018 update of the popular CycleOps Magnus wheel-on smart turbo trainer. In the construction of the M2 uses the same 2-inch steel tubing that has made the classic trainer line so strong and durable over the years. The front folding feet allow the trainer to fold down to a compact size to allow for safe travel and storage of the bike trainer. On top of the trainer’s frame is a spring loaded bolt action clamp, as well as a three position adjuster. The bolt action has a spring incorporated into it, to be sure you have a soft and secure skewer contact and it prevents it from being overtightened to the frame. The three partition adjustment on the non-drive side easily adapts the trainer to a 120 mm, 130 mm and 135 mm rear hub spacing. Have you got a bike with a Thru-Axle? No worries. CycleOps offers adapters that will fit both 142 mm and 148 mm bikes. The CycleOps M2 also has the innovative clutch knob for proper tension against your bike tire. All that you need to do is ensure the tire’s inflated to the manufacturers recommended pressure and then turn it until it clicks. What’s changed internally and with the firmware updates for the M2? Internally, there have been several changes and firmware updates since the launch of the original Magnus. All of which are incorporated into the M2. CycleOps has continued to update the ride control algorithm so the most road like feels possible as well as the least delay possible when being controlled by your favorite training application. The M2 continues to support the ANT+ FE-C communications standard as well as Bluetooth 4.0 so you can be sure that your favorite training app (Zwift, TrainerRoad etc.) will be compatible. The integrated cadence detection on the M2 uses a series of 4 magnets in the flywheel to get the high-resolution reading of the rider’s power output, and able to see the peaks and valleys within a single pedal rotation. It turns this into accurate cadence reading. PowerTuned is the same technology the CycleOps has been using on PowerTap hubs for the past 10 years and means you don’t need to ride with a separate cadence sensor indoors. The M2 has a lot of capability when it comes to resistance. 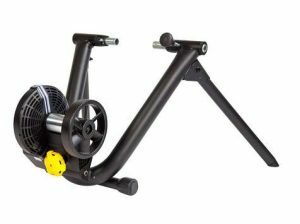 The trainer’s capable of creating up to 1500 watts of resistance and climbing grades up to 15%. The Elite Drivo Interactive Trainer is a direct drive bike trainer with electronically controlled magnetic resistance and 2200 watts of power. You have to remove the rear wheel from your bike to attach it to the trainer. But that gives you more accurate power readings with an accuracy of +/- 1 percent. Drivo indoor trainer can be attached to bikes with 130-135 x 5 mm Quicker release hubs and 142 x 12 mm thru axle hubs. It is compatible with ANT+, Bluetooth, and Zwift offering ANT +FE-C control. It sends your speed/cadence and power readings to compatible devices and apps. The three-point trainer is not as secure as other trainers. The noise level is quiet, measuring 71 decibels at 200 watts, and it measures 19″ x 15″ x 32″. The case is made of less durable plastic. 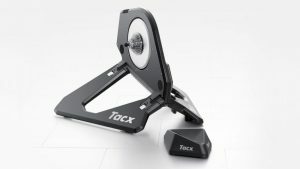 The Tacx Flux T-2900 Trainer is a compact and realistic direct drive cycling trainer that requires removing the rear wheel of your bike to attach to the smart turbo trainer. However, that reduces tire wear and provides more accurate power readings that are accurate to +/- 3%. The seven-kilogram flywheel offers a smooth ride. The eight electromagnets provide a realistic change in resistance and torque, providing the feel of a real road ride. It provides 1500 watts of power and a 10 percent gradient simulation. Both of these numbers are low when compared to other bike turbi trainers. It is also noisier than the Neo. Although, it quiets down after you get a regular cadence, measuring 71 decibels at 200 watts and 80 RPMs with a maximum of 86 decibels. The legs do not fold but provide a stable base, so you will not tip over. The Flux T-2900 is compatible with Bluetooth, ANT+, and Zwift; transmits via Bluetooth and ANT+ FE-C; and transfers readings to any smartphone, computer, or tablet. It can use 9 to 11-speed cassettes. 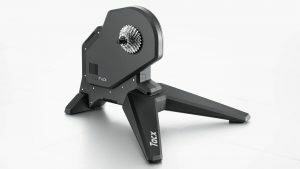 Tacx FLUX Smart: a fully interactive & functional Smart direct drive! Dumb trainers cannot use Zwift or communicate with your electronic devices. So, they cannot receive changes in resistance that coordinate with the virtual course you are viewing. They also cannot record and transmit your power and cadence readings. Smart trainers can be controlled by Zwift to increase your resistance in relation to the virtual course you are viewing. They can also transmit changes in your power and cadence. Zwift can use that information to change your position on the virtual course you are viewing. This can add to the fun of your training, especially if you are racing against other riders. Overall, smart bike trainers add an element of fun to your workout. Smart trainers connect to your bike in one of two ways, either wheel-on or direct drive. With the less expensive wheel-on versions, you attach the smart trainer at the rear axle with the rear wheel of your bike intact. For direct drive trainers, you need to remove the rear wheel of your bike, install a cassette on the trainer, and then, attach your bike. Wheel-on smart trainers are lighter and easier to set up than direct drive versions, but it takes a longer warm-up time to calibrate them. In addition, the power measurement is not as accurate as it is with direct drive versions Wheel-on smart trainers also can be folded compactly for storage or travel. Direct drive versions require less warm-up time to calibrate and are more accurate in measuring the level of power you are generating than the wheel-on versions. They are also quieter and provide pop-out legs. 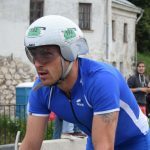 You can get more accurate stats, and stats more consistent with your outdoor cycling, by connecting a power meter to Zwift and then to your smart trainer. Just be sure that whatever smart trainer you choose, that the base is broad enough and sturdy enough to prevent your bike from tipping over with you when you are peddling hard. Smart trainers use ANT+ or Bluetooth and Wi-Fi to send feedback from a cycling power meter or from estimates by ANT+ or Bluetooth speed and cadence sensors concerning your speed, cadence, and power to Zwift and to your computer or smartphone. You can also use Zwift apps with your smart trainer and computer or smartphone to change directions, use power-ups, join other riders, take screenshots, message other riders, and compile fit files to upload to Strava. You just have to be aware that all smart trainers use ANT+ FEC or Bluetooth FTMS for open or standard communication but for private communication, they use private-ANT or private Bluetooth Smart. However, there is no standard for controlling smart trainers with Bluetooth Smart. So, make sure that the smart trainer is compatible with Zwift. Triathlon watches, Garmin Edge, or Wahoo ELEMNT BOLT are now being made compatible with smart trainers. These devices can record the signals or can control the trainer. So, you can recreate your personal cycling excursions. With the information received from Zwift, smart trainers increase resistance when the course is uphill and decrease it when the course is downhill. They also decrease resistance when you are receiving a draft from a pack of riders you joined and increase resistance if you take the lead of a pack. Additionally, at least one model duplicates the feel of dirt or cobblestone roads. Your indoor training can be enhanced with a smart trainer. Information about your power and cadence can be transmitted to your computer or smartphone. Your cycling power and cadence will be varied by the resistance changes that relate to the virtual course you are viewing. You will be adding fun and can also add some social camaraderie to your indoor workout, making it more enjoyable and less tedious. So, you are more likely to keep to your workout schedule with a smart trainer. After researching the smart trainers, we have chosen the best direct drive smart trainers based on the following information. All smart егкищ trainers have pros and cons, but two seem better. The Tacx Neo provides a greater variety of terrain replications that make it extremely fun. But its power readings are off more than other smart trainers. The CycleOps Hammer has the more accurate power readings. If you stop for a second, it delays the start of the resistance until you get a good start again. However, it is noisy, and there is a lag time on resistance changes when you encounter things like going up or down a hill. Also, there is a software issue with zero watt dropouts, where suddenly you have no power. And that can leave you behind if you are riding or racing with others. The Wahoo KICKR 2018 fits all bikes from 24″ to 29″. And it measures power directly at the hub, providing a consistent, accurate power readings. And it’s very quite. The Elite Drivo has 2200 watts of power and fits a variety of bicycle hubs. But the case is made of plastic and the resistance slips. 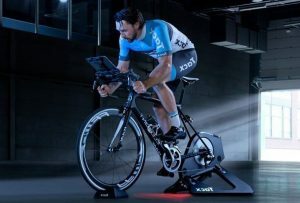 The Tacx Flux T-2900 Trainer is an adequate trainer, but it does not have the power or the gradient simulation percentage of other trainers. 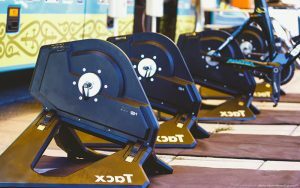 Of these bike trainers, we like the Tacx Neo and the Wahoo Kickr 2018. However, we have chosen the Tacx Neo as the winner because of the fun of the extra variations of terrain replications. I choose between Neo and Drivo, but I tend to Neo. To your knowledge, have the wattage dropouts been addressed on the Hammer? Cycleops issued new Firmware update and supposedly fixed the dropout issue.